size and loaded with so many different flavors at once. 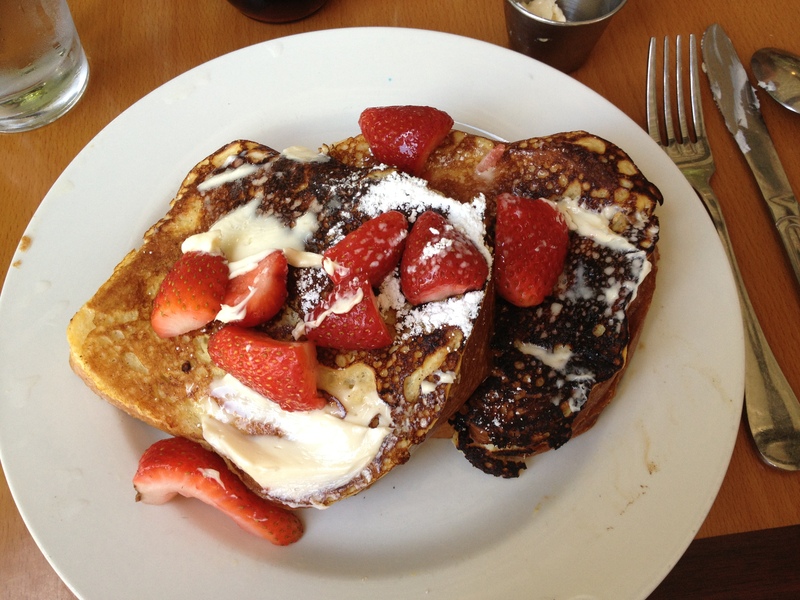 Of course I went completely low-fat and indulged in their Brioche French Toast!!!! 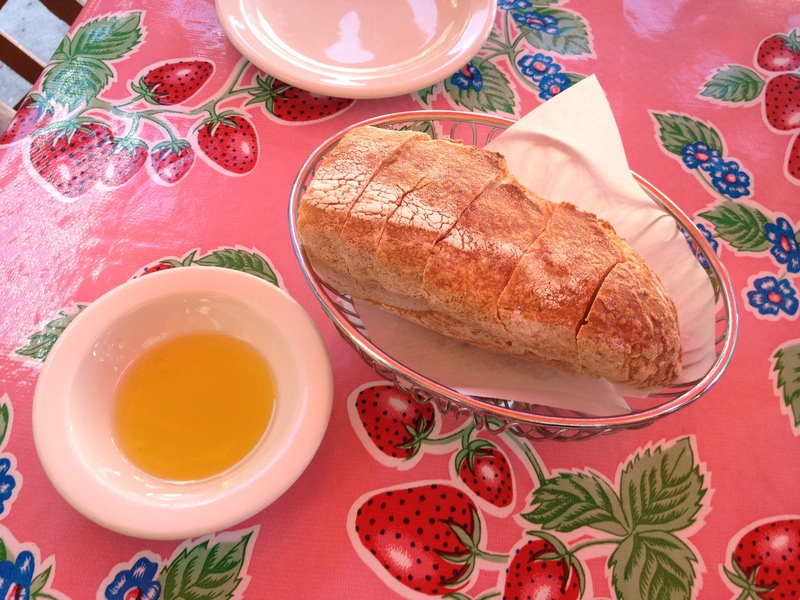 For those of you who don’t know, Brioche is a pastry similar to a highly enriched bread of French origin, whose high egg and butter content give it a rich and tender crumb. 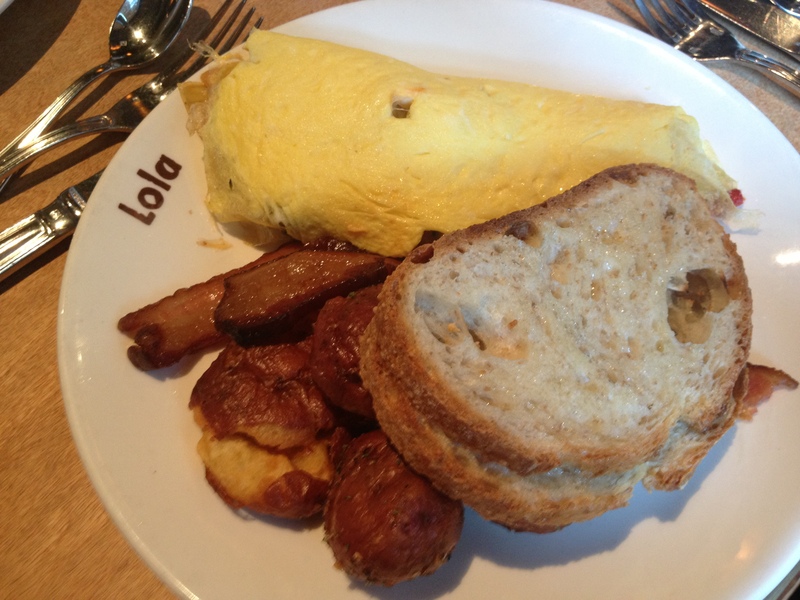 Therefore, the French toast was nice and fluffy, not heavy at all. You really don’t even need syrup on this dish because it is already sweet from the fruit. The best part, it is only $9.00. It left us wanting more and we talked about it the rest of the trip. 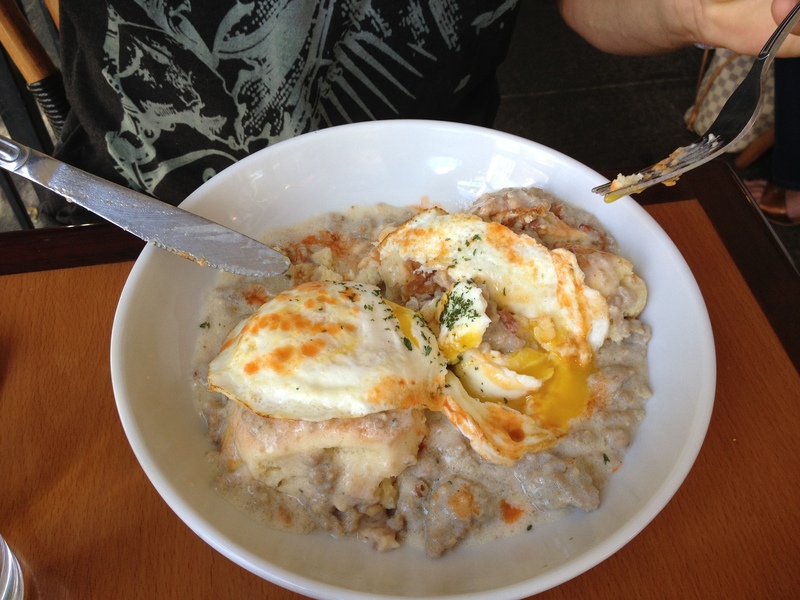 Of course, we had to try the Biscuits and Gravy with homemade sausage next. We ate our food in under five minutes and wanted more, but we were too full, sadly. 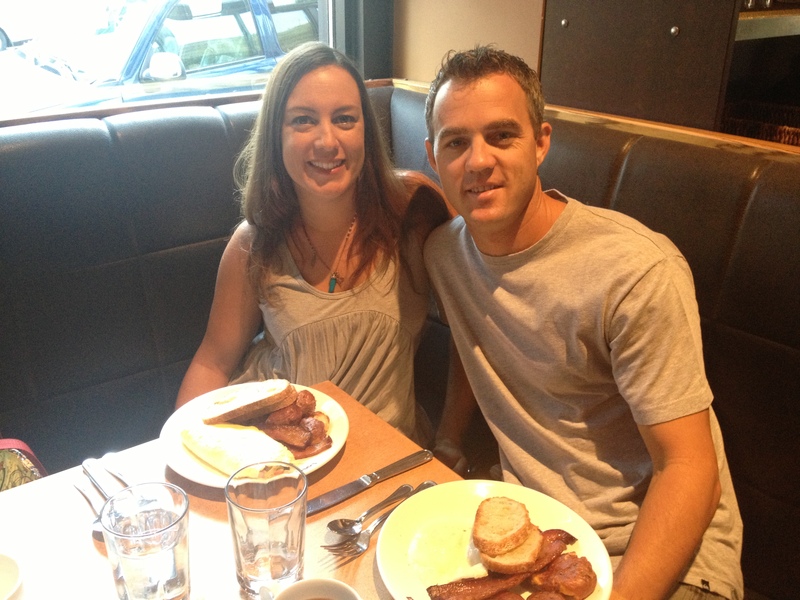 We highly recommend this restaurant for breakfast. I must warn you that there can be a long wait to get it. There were a ton of people standing outside waiting to get in- a great sign!! 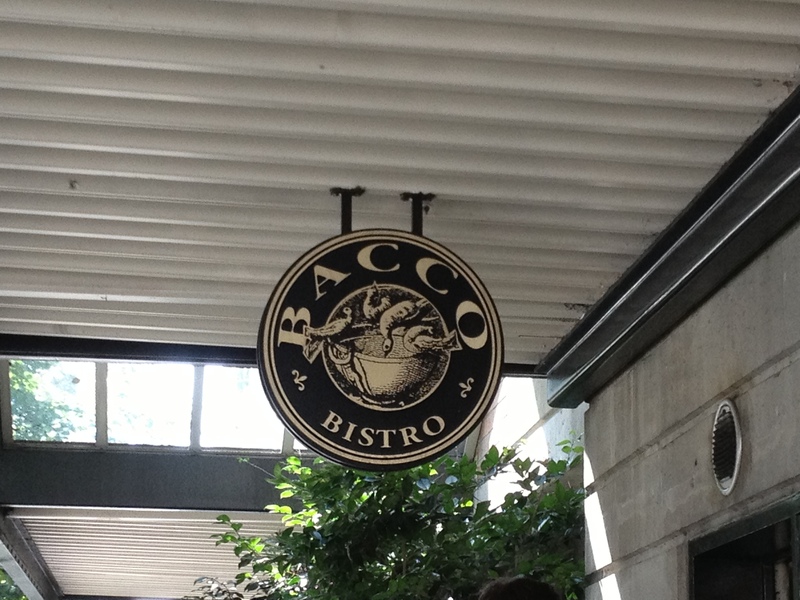 For more information, check out their Facebook page at https://www.facebook.com/pages/Bacco-Cafe/111519468888369. Restaurant, just walking the streets of Seattle. The smell and the crowd standing outside is what caught our eye. We knew this had to be great pizza!!! I can honestly say that we have never experienced a 1.5-2 hr wait for a pizza place. We put our name down and were told that the wait would be approximately 1.5 hours. People walked out of the restaurant holding a pizza to go box and we asked them if it was worth the wait and they said “definitely”. Unfortunately, we were not anticipating the wait so we were left famished and moody walking the streets of Seattle and almost didn’t wait. Then our cell phone rang and it was Serious Pie time!! The menu has very different pizza options. I have listed the pizzas below. 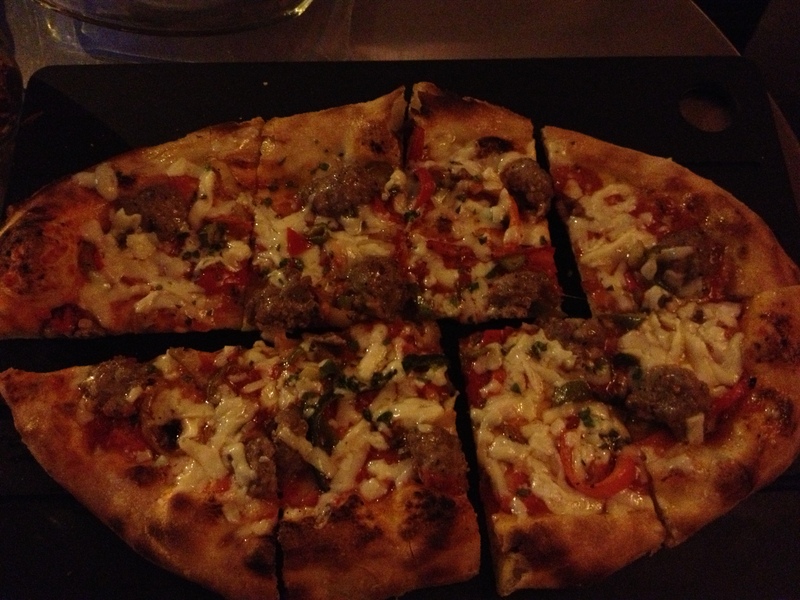 We chose the sweet fennel sausage, roasted peppers, provolone which was very tasty!!! The fennel sausage especially stood out with each bite. The pizza crust isn’t too thin or too thick, just a light medium crust. 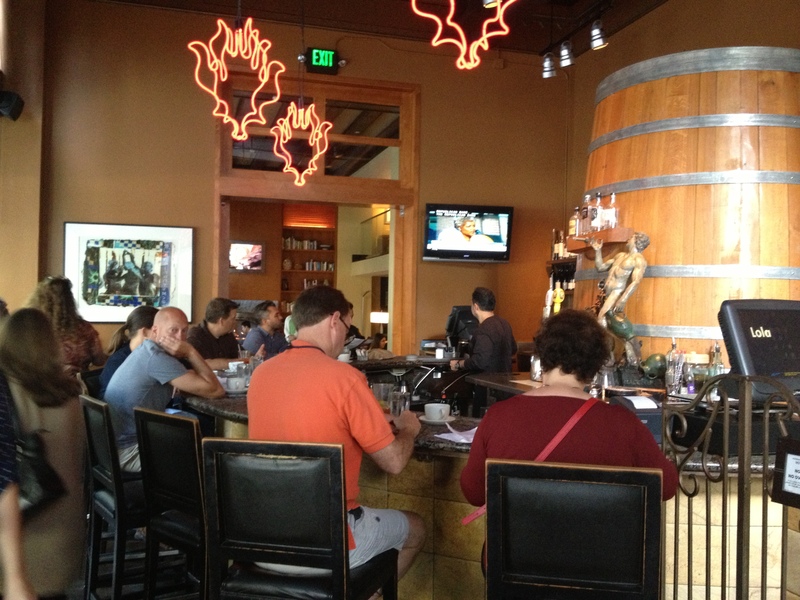 It is very warm in the restaurant from the wood burning ovens. 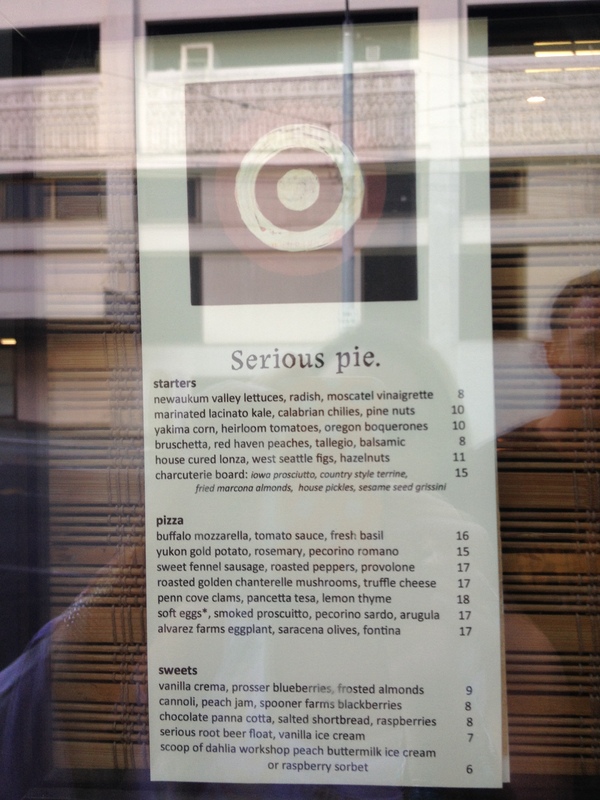 They offer a happy hour from 3-5 p.m. Monday-Friday where mini pies are only $6, wine $5 and beer for $4. 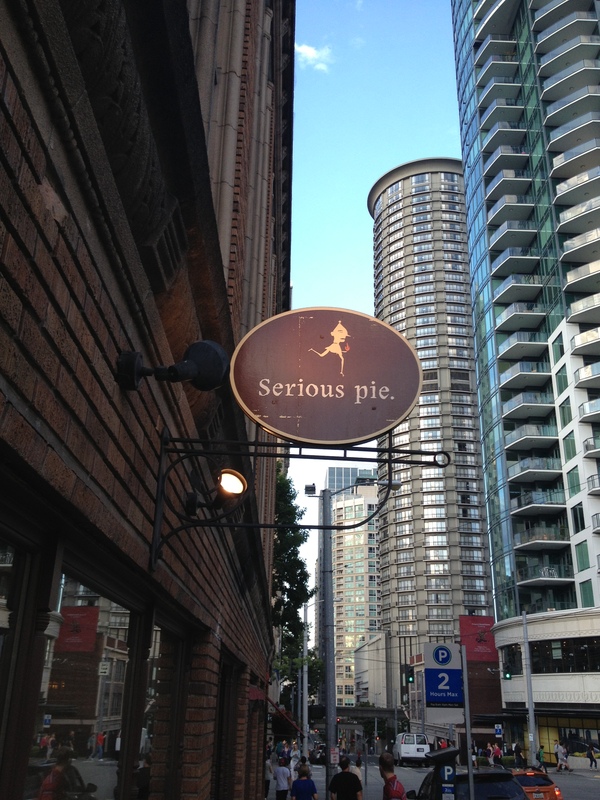 Serious Pie is in a great location for walking around while awaiting your reservation. We walked to Pike Place and hung out for an hour while waiting for our reservation. A little about Tom Douglas: Tom Douglas was born August 2, 1958. He is an American executive chef, restaurateur, author, and radio talk show host. 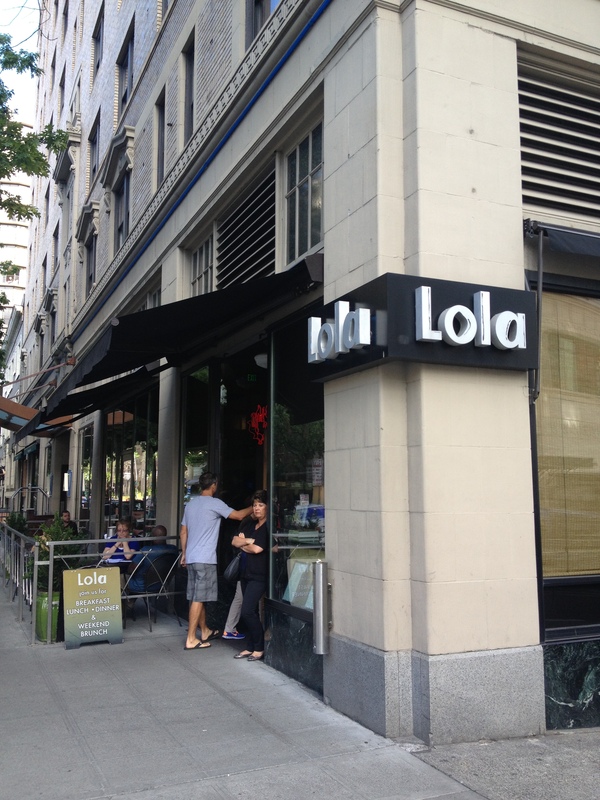 He is known for winning the 1994 James Beard Award for Best Northwest Chef. Tom also won the James Beard Award as Best Restaurateur. He is the author of Tom Douglas’ Seattle Kitchen, which was named the Best American Cookbook by the James Beard Foundation and KitchenAid, in 2001. He appeared on an episode of the Food Network’s Iron Chef America in 2005, where he defeated Chef Masaharu Morimoto and was named Iron Chef. 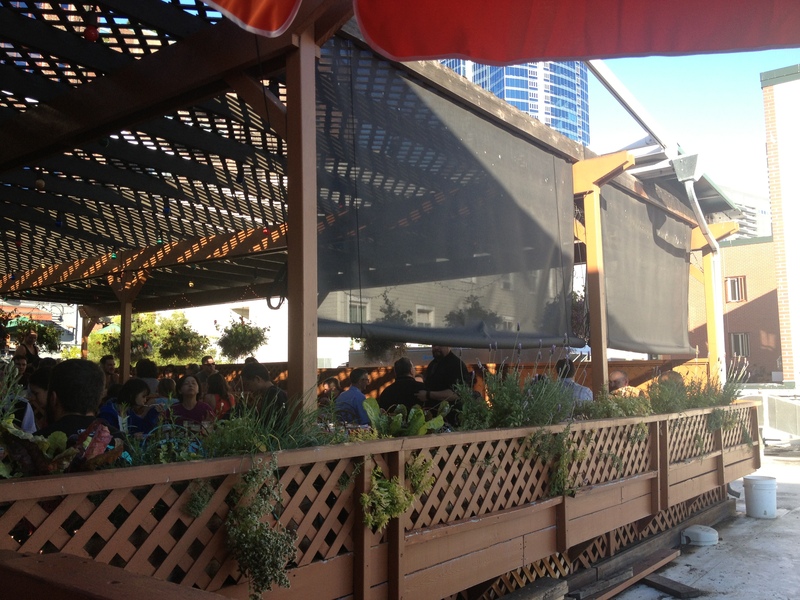 would picture an earthy, rustic but modern, trendy tucked away spot. It is nestled in the bottom of Hotel Andra on the corner of 4th and Virginia. The menu is all farm fresh and you can taste the freshness in every bite! They also have the best potatoes I have ever had, very different. They use new potatoes and bake them in the oven, smash them down with a spoon after they’ve been baked -until they slightly break open and then fry them. They were so soft inside and not greasy at all but crunchy on the outside. They were rolled in herbs and sea salt. Yes, we asked the waitress exactly how to make them. They were that good. The ambiance at Lola is really fun with a sit up bar where people are reading the paper in the morning and drinking their coffee. lights hanging from the ceiling. The restaurant opens up to Hotel Andra, where people are checking in and out with constant movement. The waiting area for the restaurant in actually in the hotel lobby where you can people watch. The restaurant is located on a corner as well, so once you are seated you can watch people walking on the streets. Our wait was about 40 minutes and definitely worth it!! that there would be a fabulous restaurant with a ton of life taking place behind that simple pink door. The Pink Door is EXACTLY what we were looking for in the way of exciting, unique and different from Kauai. 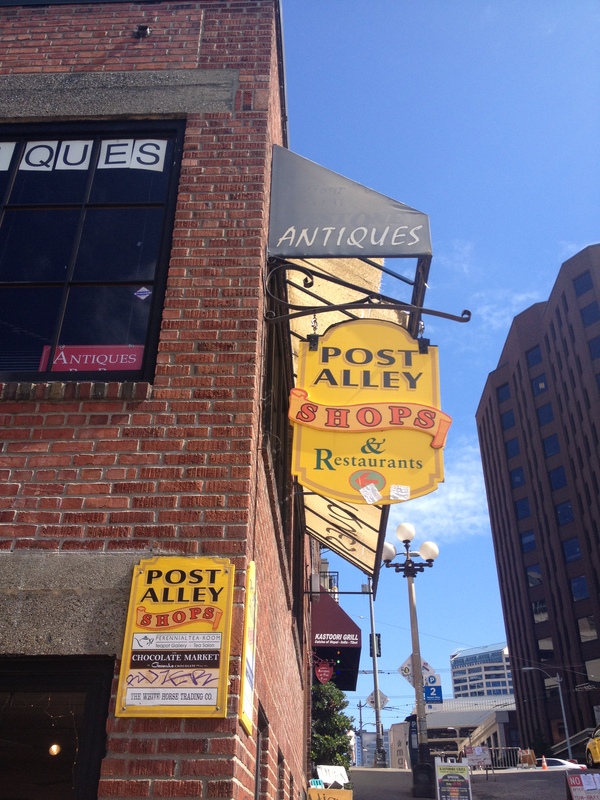 It is located on Post Alley and for those of you who are unfamiliar with Post Alley, as we were, it is more than one alley!!! 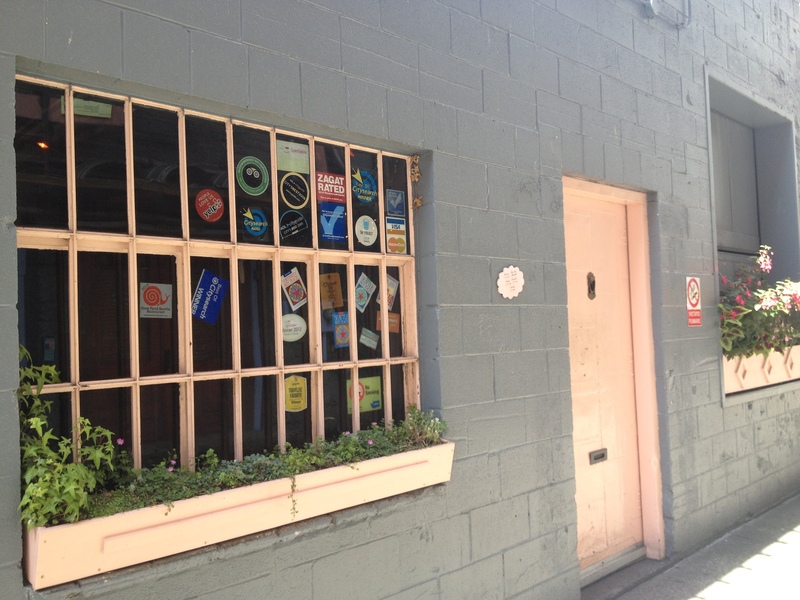 Post Alley is an alley which runs along several blocks, which made finding The Pink Door somewhat challenging. Now we were even more intrigued to discover The Pink Door. We walked around Post Alley in the afternoon to locate this pink door prior to our dinner reservation. 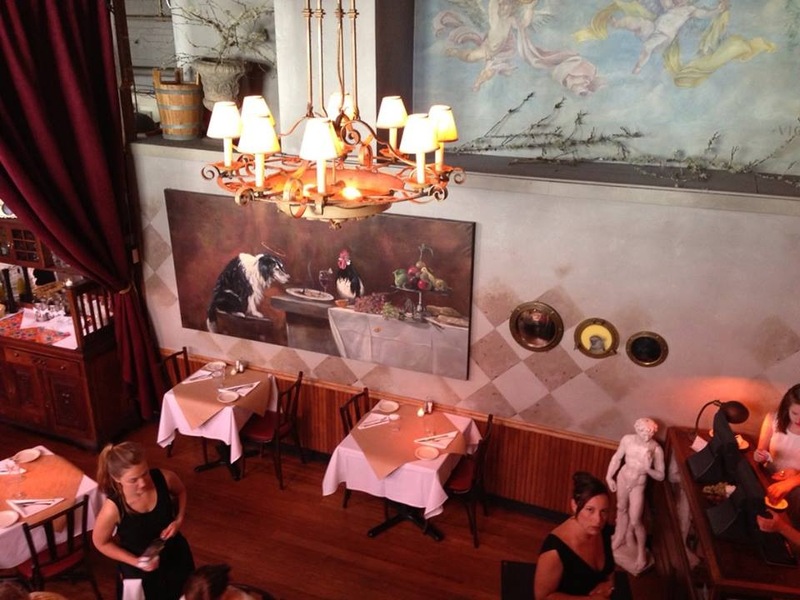 We had never eaten at a restaurant which offered Cabaret, Tarot, Opera and Magic all in one place. The first thing I noticed upon entering was the blue velvet swing on the ceiling. Once you step foot inside the restaurant, you are looking down into this old world Italian decorated, family style restaurant. One wall is cement block which gives you the feel of being underground in very old building, which is throughout Pike Place. We happened to be at Pike Place during the 100 year anniversary which seemed to bring everything more to life. waitresses were dressed in black with white aprons. 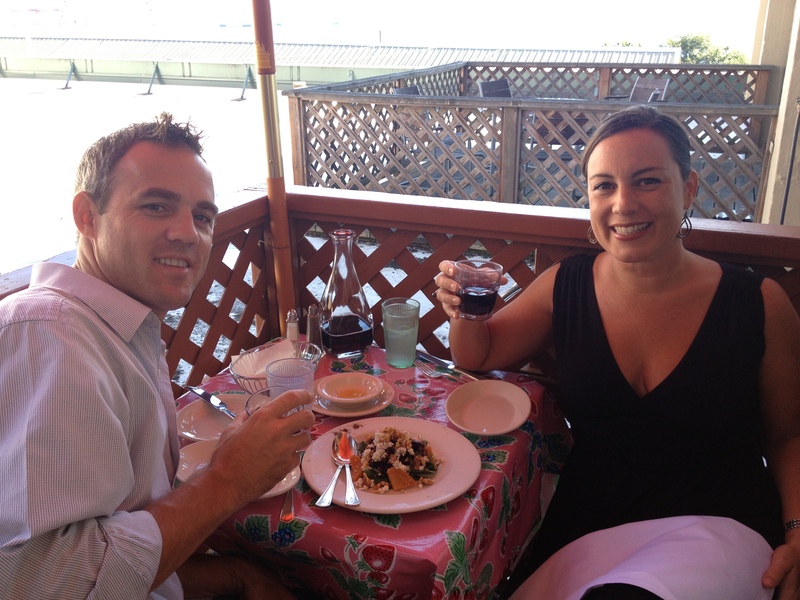 We were seated on the outdoor patio which had a completely different feel from the inside of the restaurant. The tables outside were covered in vinyl tablecloths of all colors. None of them matched each other. The patio sat inside of a lattice fence which looked out onto the waterfront. were completely satisfied with the wine and bread alone. 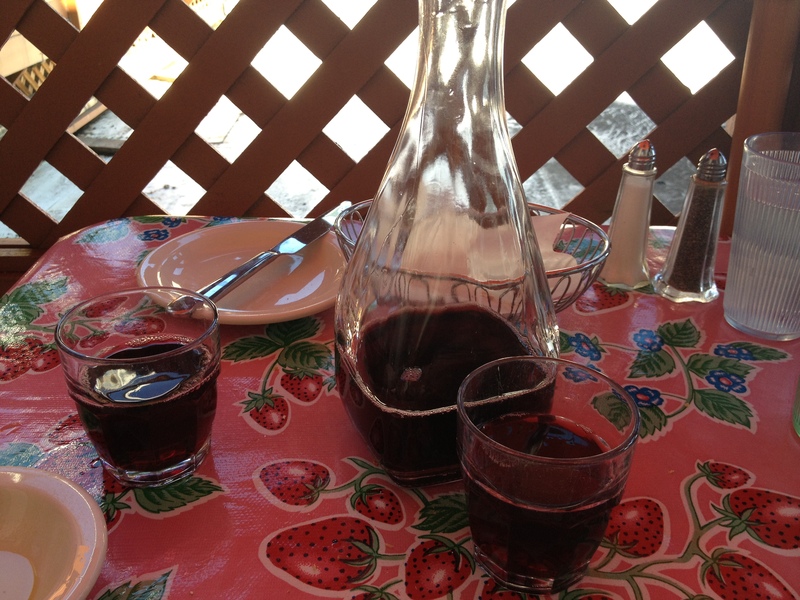 Loved the small wine glasses which were perfect for the patio! Cheers!! 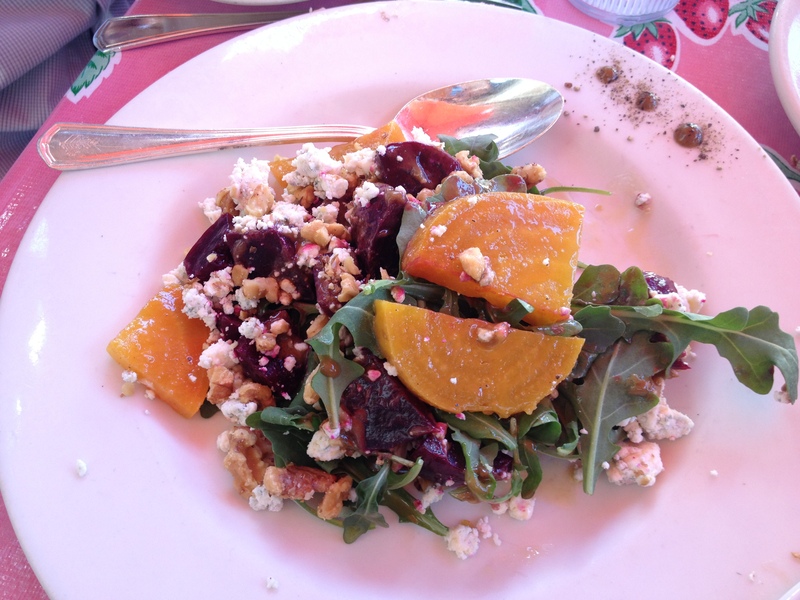 For our first course, we ordered the roasted beets, arugula, gorgonzola cheese & toasted walnuts salad. Amazing!! My husband isn’t a beets fan and absolutely loved it. Plus it’s pretty to look at. The salad is light and perfect to share. 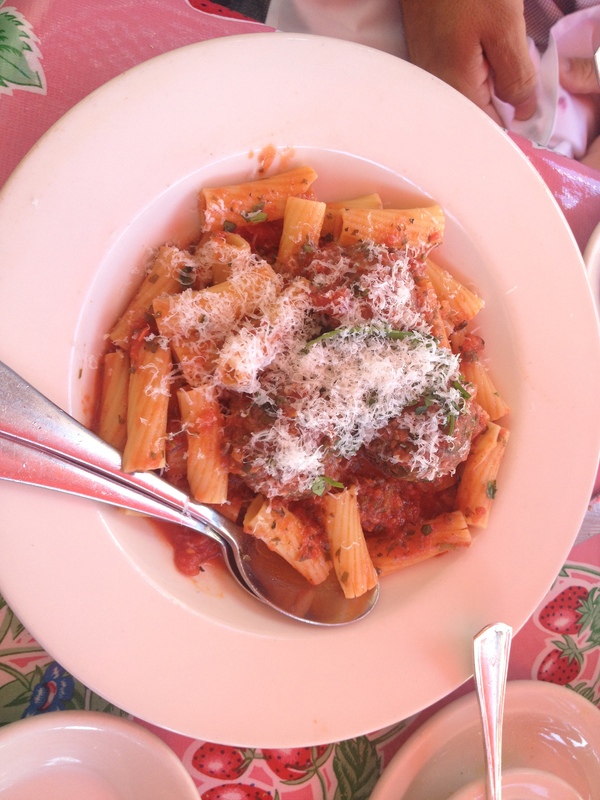 The Pink Door has Italian-American food which are family recipes inspired by Sunday gatherings at the Padrona’s. They offer quarterly seasonal menus which are drawn from the ever-changing seasons of the farms in the Northwest. split. The sauce tasted very homemade and rich. The meatballs were large and moist, just melted in our mouths. The menu is not large, but offers a variety of options from seafood to baby-back ribs. Finally for dessert we ordered something so delicious. 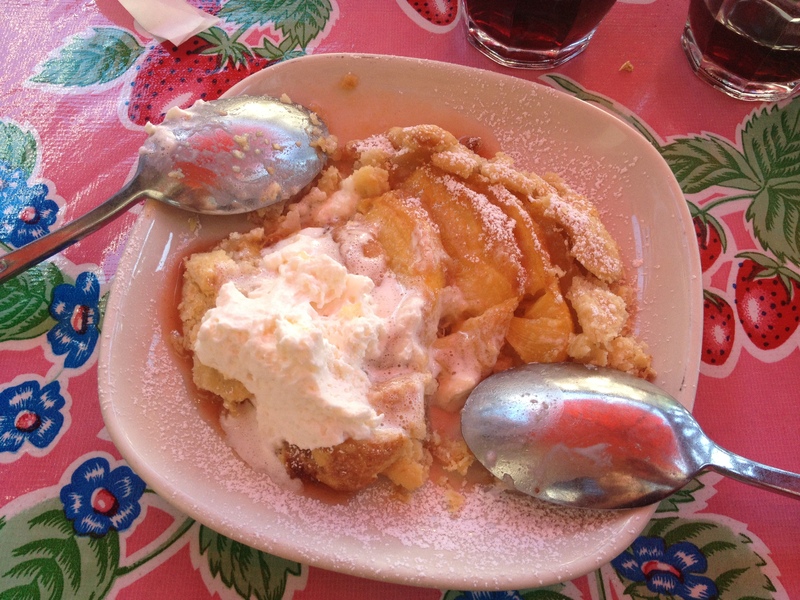 It was kind of like a peach cobbler, served warm but made with a crust and fresh peaches. 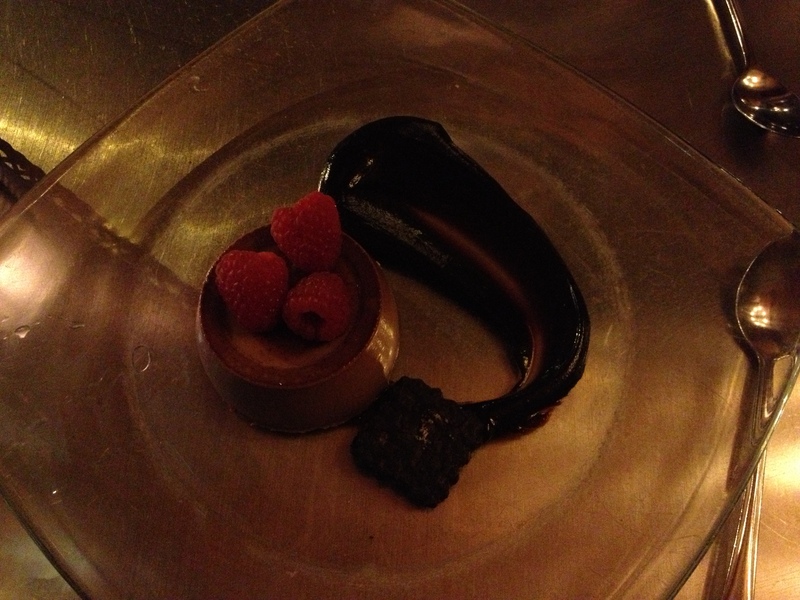 My husband, who normally doesn’t eat dessert, finished it off. 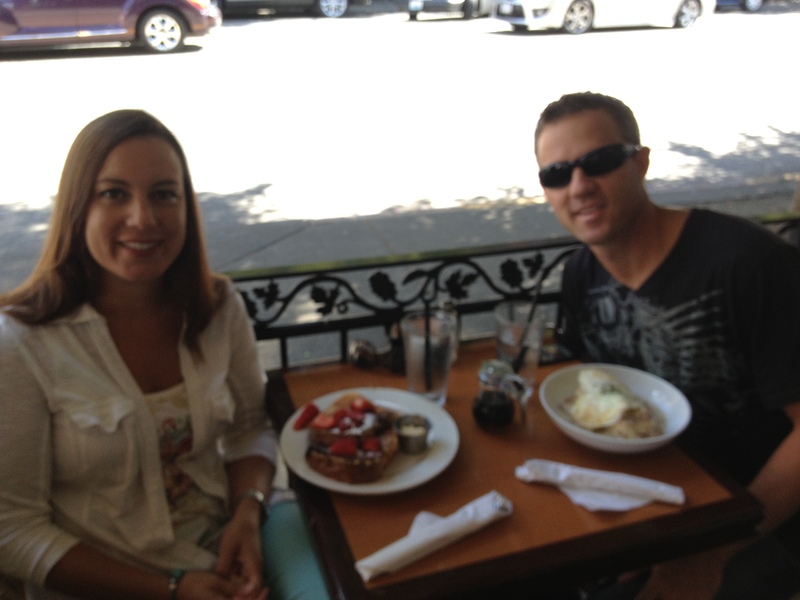 Next time you are in Seattle, you must visit The Pink Door!! 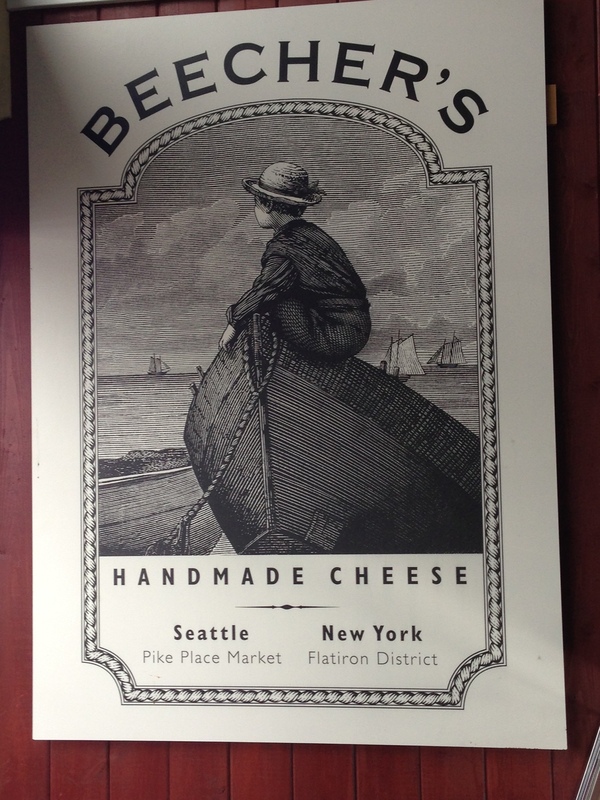 When walking through Pike Place, you cannot miss Beecher’s Cheese store. 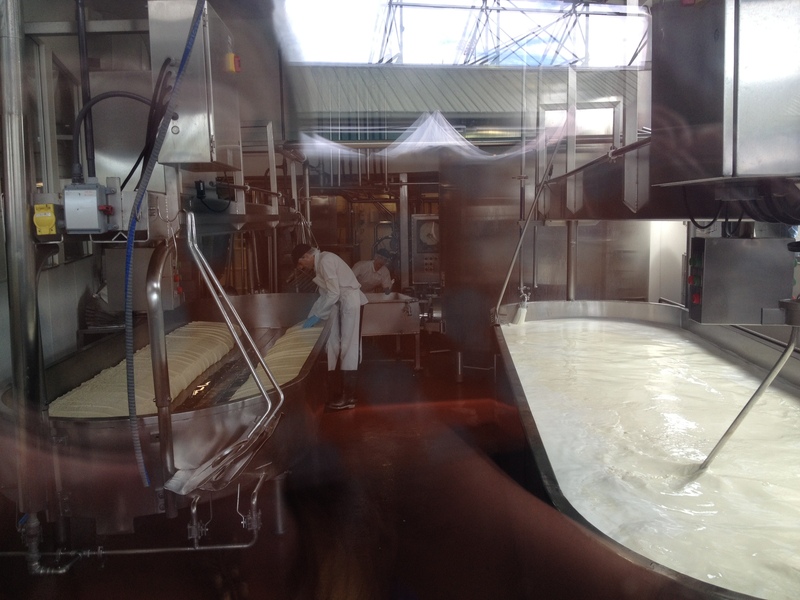 “At the Beecher’s Handmade Cheese shops in Seattle’s historic Pike Place Market and New York’s Flatiron District, visitors press their noses against the windows to witness a vat of creamy white milk transformed by the expert hands of the cheesemaker. Although he is aided in the process by simple machinery, the cheesemaker is crafting cheese using the same techniques that have been used for thousands of years. 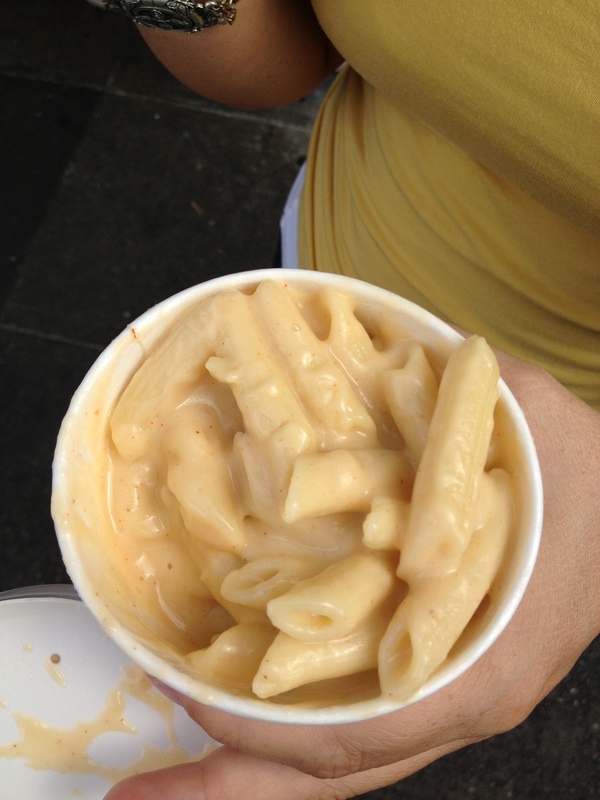 We walked into the store and asked what is the most famous thing that you sell here and they said- Mac & Cheese. So Mac & Cheese it was. To die for! It is very rich and creamy. If you don’t make it to Seattle anytime soon, visit the website and purchase the cheese on line!!! They sell gifts, cheese, side dishes, cook books and items to go with cheese. It’s everything cheese at Beecher’s. 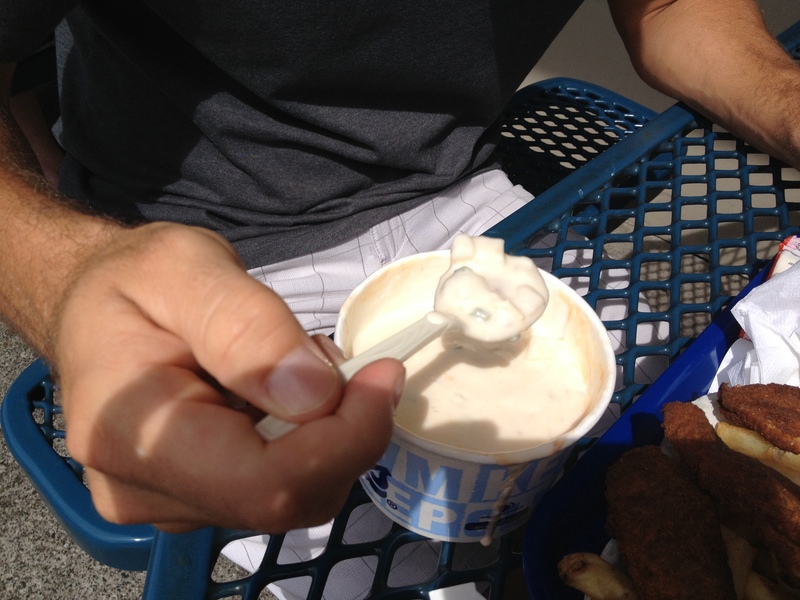 a sunny day, eat clam chowder and watch the seagulls. But watch out for your food! 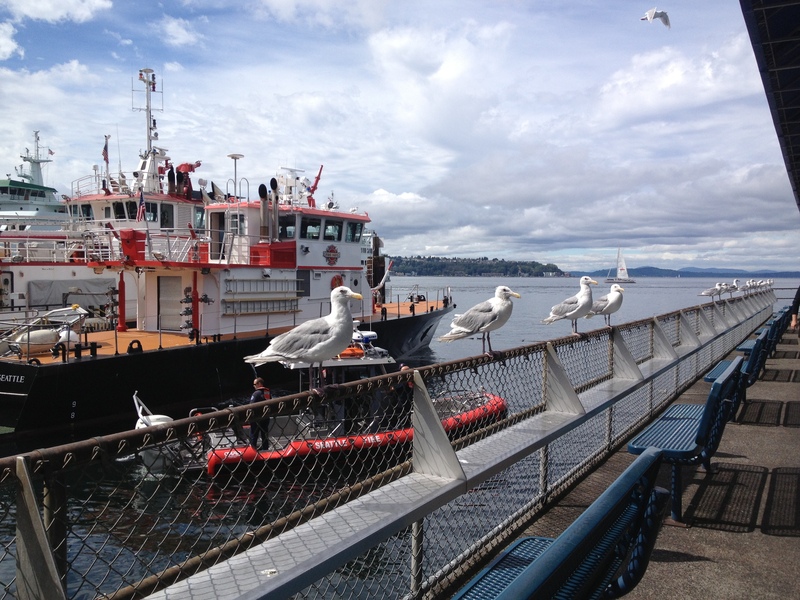 The seagulls love to watch your food while you watch the waterfront. 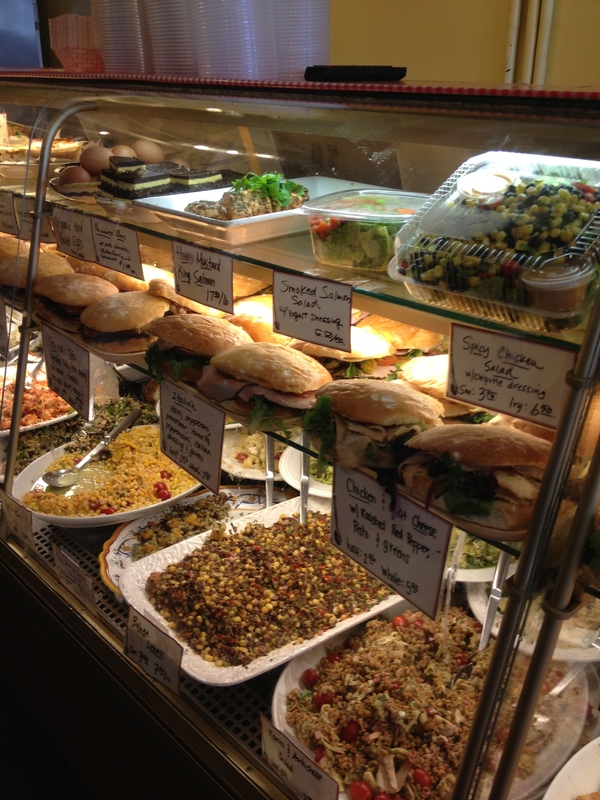 As you can see in the picture above, not too many people opt to eat up at the counter and have those seagulls stare you down. 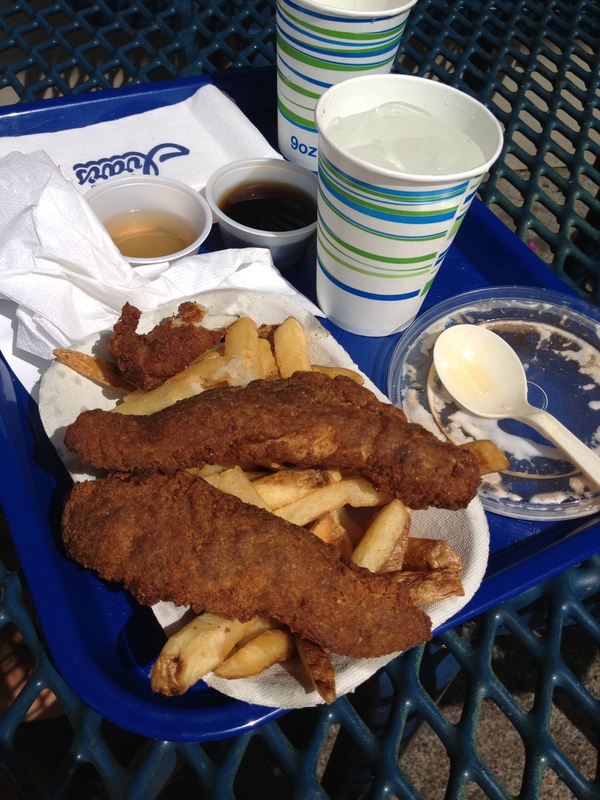 Ivar’s not only has great chowder, we also had to try the Cajun-style fish and chips with lots and lots of malt vinegar and garlic malt vinegar. Yum!!! 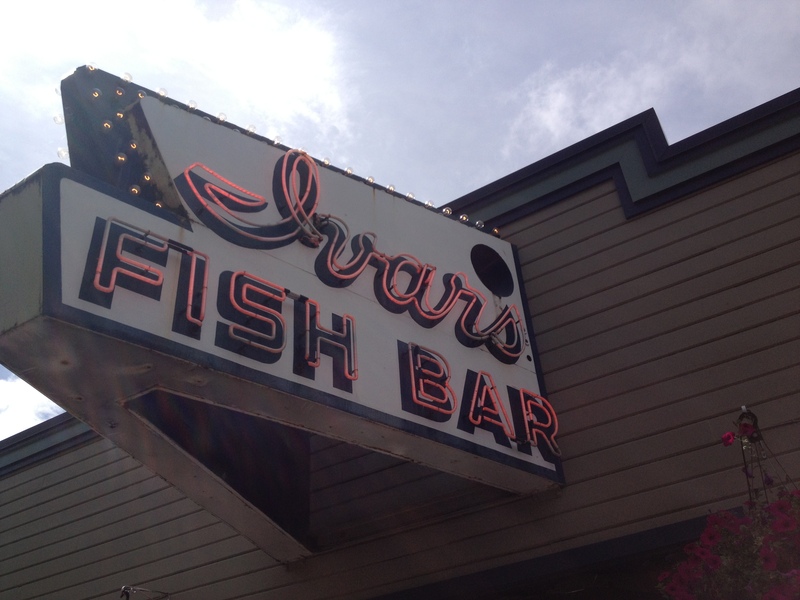 Ivar’s is a seafood restaurant chain based in Seattle. aquarium on what is now Pier 54. Then, he decided to add a companion fish and chips bar to feed his visitors. The bar was short-lived and on July 22, 1946, he opened a new restaurant, Ivar’s Acres of Clams, at the same location. Ivar’s has two other full-service restaurants: Ivar’s Salmon House in Seattle’s Northlake neighborhood, and Ivar’s Mukilteo Landing in Mukilteo, Washington, next to the Washington State Ferries terminal. There is a fishbar outside of all three full-service restaurants. All its other locations are seafood bars. 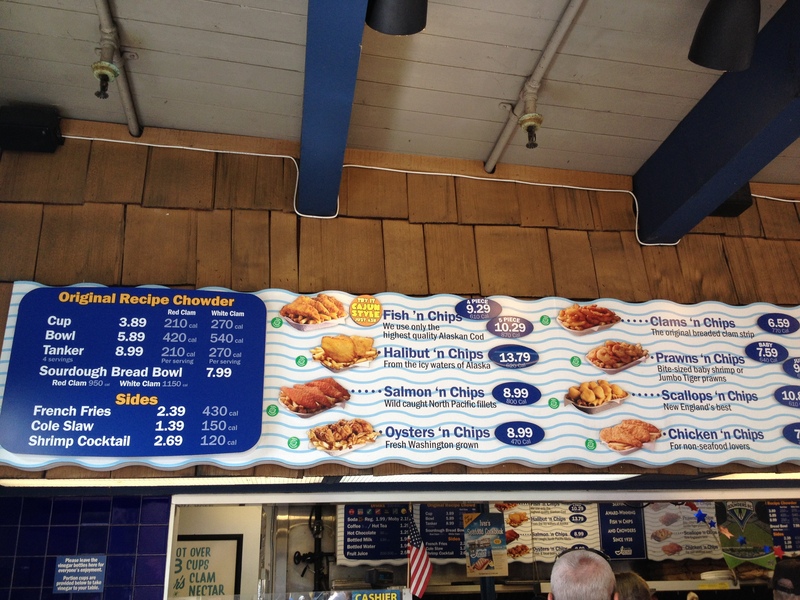 Ivar’s created the famous saying of “keep clam” that is posted all over each of the eateries. 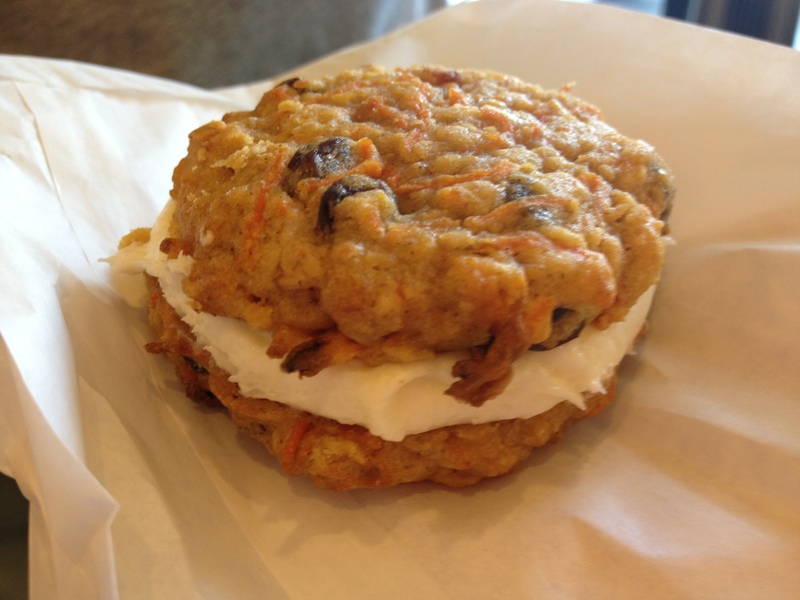 that I will purchase upon returning to Seattle. We were just passing by, when we saw it in the window!! They should ship them to Hawaii. All of their foods looked amazing. abudance of coffee shops- literally on every corner in downtown Seattle, there is only one that we love and that is Tully’s Coffee. Everyone has their preference in coffee and on Kauai we are so limited. It was a very hot day at Pike Place in August, so we opted for an Iced Tea Latte with Earl Grey tea. Simply blissful, cool, and refreshing to walk the streets of Pike Place. If you haven’t had a Tully’s coffee, try one while in Seattle. 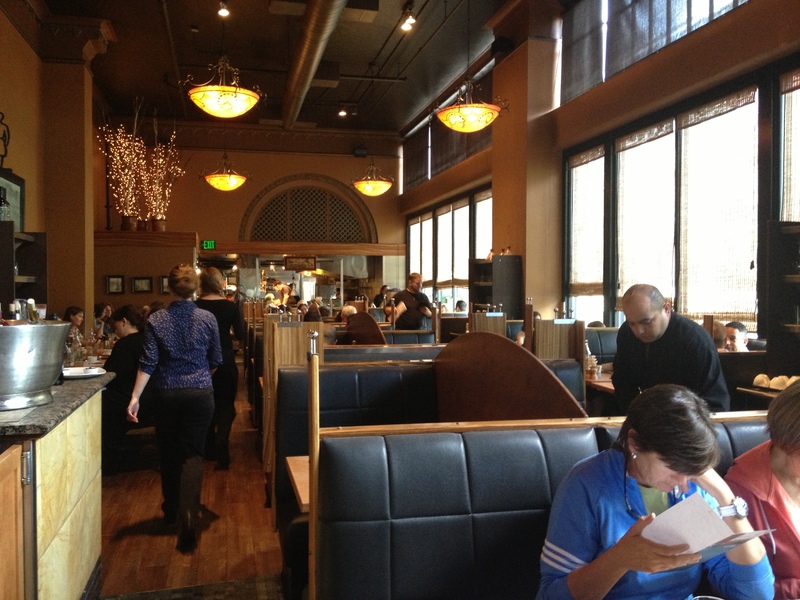 Tully’s Coffee first opened in 1992 as a specialty coffee retailer and wholesaler based in Seattle. 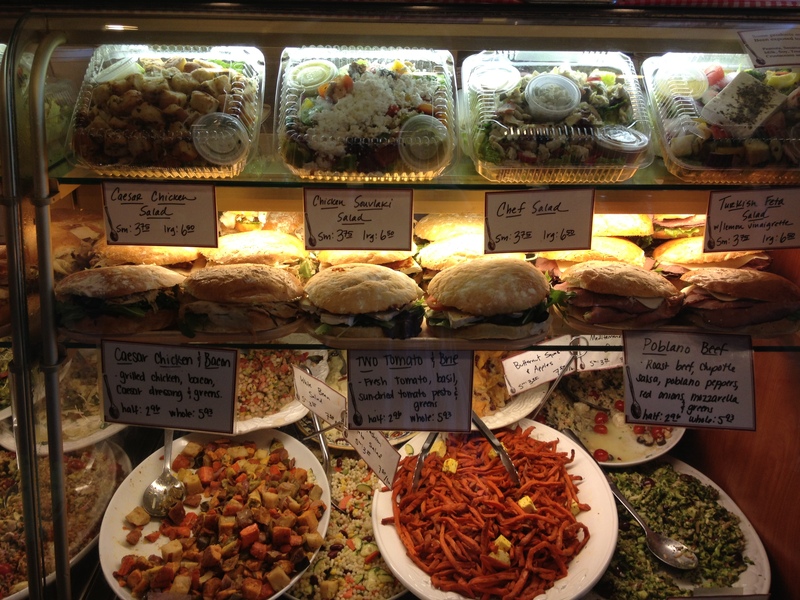 Tully’s serves specialty coffees, espresso, baked goods, pastries, and coffee-related supplies. It also has overseas licensing agreements in Japan and South Korea. Tully’s Coffee is well known for once following an expansion strategy of opening stores adjacent to those of the considerably larger coffee chain Starbucks, also based in Seattle. Tom Tully O’Keefe is the founder of Tully’s Coffee. His goal was to rival the quickly expanding Starbucks coffee. Tully’s is currently a strong regional specialty-coffee retailer that was concentrated in Puget Sound, where coffee loyalty is so deep there is one coffee shop for every 4,000 people. The president and CEO has described Tully’s focus as no longer on competing against the mega giant Starbucks, but on serving fine hand crafted coffee. room. 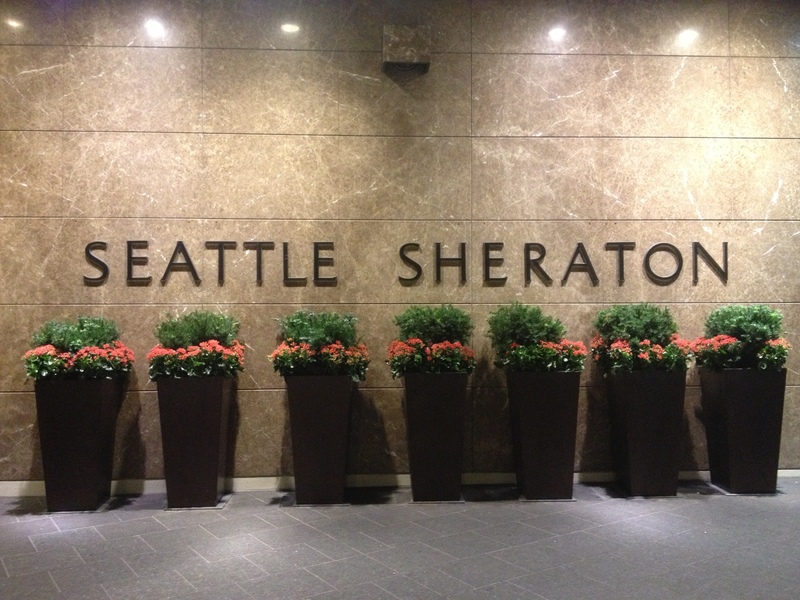 We highly recommend this hotel for the location, as you can walk all over downtown Seattle, Pike Place, great restaurants nearby and shopping. 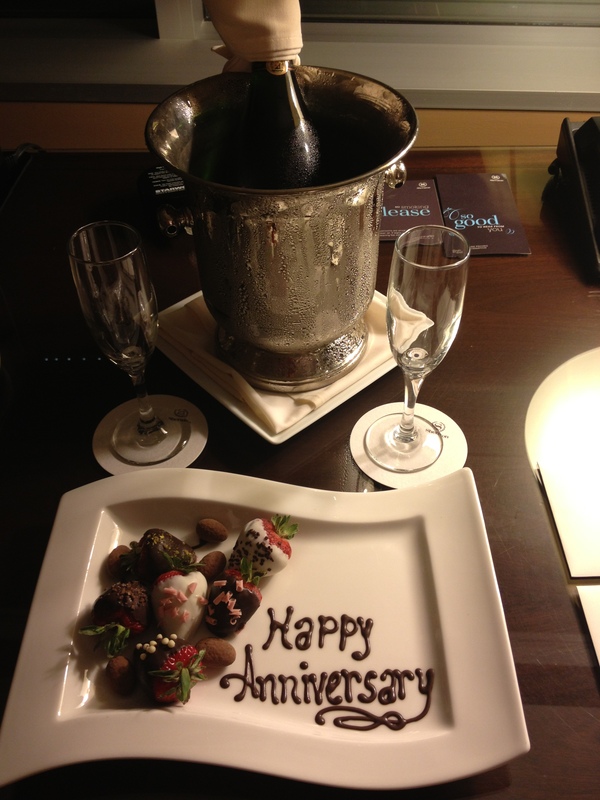 Not to mention the great concierge staff who assisted us immensely. Had we stayed elsewhere, we would not have experienced the spectacular eateries that we did!!! !